Distortion due to excessively close vanishing points is a common error because close vanishing points in general are easier to handle than distant ones. So don't let laziness trap you. But also avoid the opposite extreme. Placing vanishing points too far apart is also wrong because it results in minimal convergence and hence a sense of flatness. IN GENERAL: Convergence is minimal at the center of a picture and increases as you approach the circumference of the cone of vision. Beyond this range unrealistic and unacceptable distortion begins to occur. And naturally the further you go, the worse things get (above). Assuming this is a 6 x 6 x 6-ft. cube, then the guide lines to vanishing points make all posts shown dotted also 6 ft. high. The top guide lines could be called the 6-ft. "height lines." If we wished to draw a 6-ft. man at point X we would simply extend forward the appropriate bottom guide line and height line. Suppose the figure were not on an existing guide line but, for instance, at the spot marked ©. From the top of this imaginary post draw another vanishing line. This is the 6-ft. height line for spot ©. Suppose you wanted to draw something 12 ft. high. Simply double the 6-ft. height and carry around the new 12-ft. height line (lightly dotted). If the constructions above were imagined as a series of 6-ft.-high picket fences or walls, then the "height line" would be a real thing instead of an imaginary guide line. Here we see more clearly how these lines establish heights as they are "carried around." 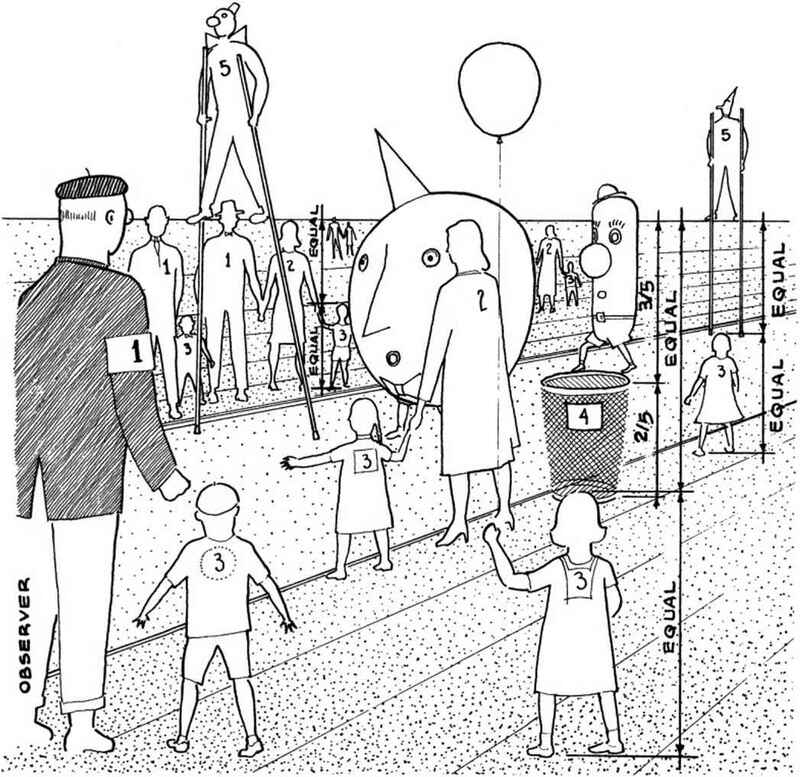 In this case, those persons (1) of about the same height as the observer and standing on the same ground plane would have their eyes at the same level as the observer's (i.e., on the horizon line). Those (2) a few inches shorter (e.g., most women) would have the tops of their heads approximately at eye level. Children - let's say 2% ft. tall, about one-half the height of an adult — would naturally have their head-tops about half way up any standing adult figure. Therefore — no matter where they are placed (3) — the distance from the tops of their heads to eye level must equal their body height. With eye level about 5 ft. from the floor, a 2-ft.-high wastebasket (4) would stand, wherever it were placed, at the bottom 2/5 of a vertical from ground to eye level. What about the 5-ft. men on 5-ft.-high stilts? The footrests are at eye level, therefore these 10-unit figures (5) would always appear one-half above eye level and one-half below, regardless of where they stood. The proportions used above for heights related to eye level are all verified in side view. 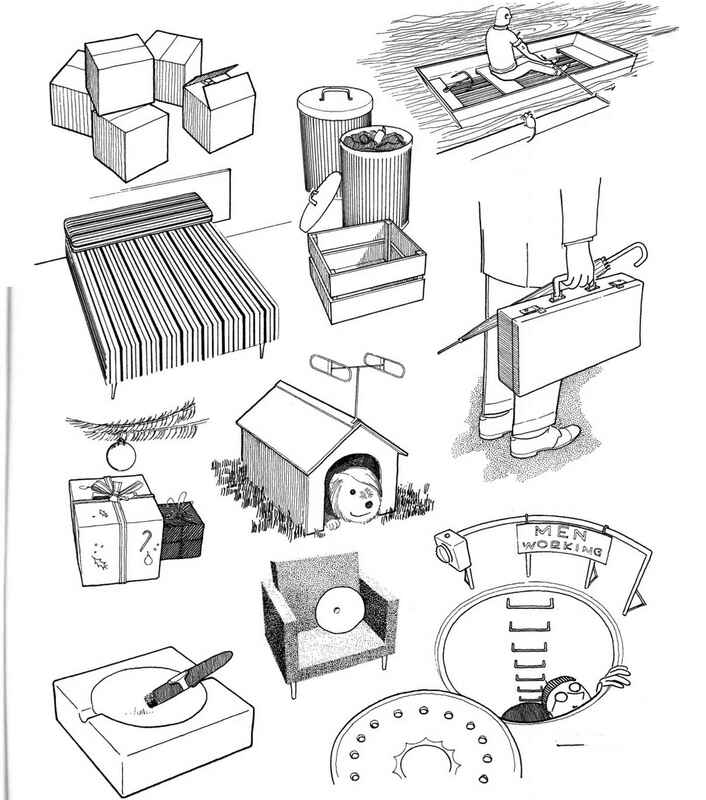 It should be noted though that these proportions can be worked out "in perspective" without this aid. Reviewing the steps above will show this. 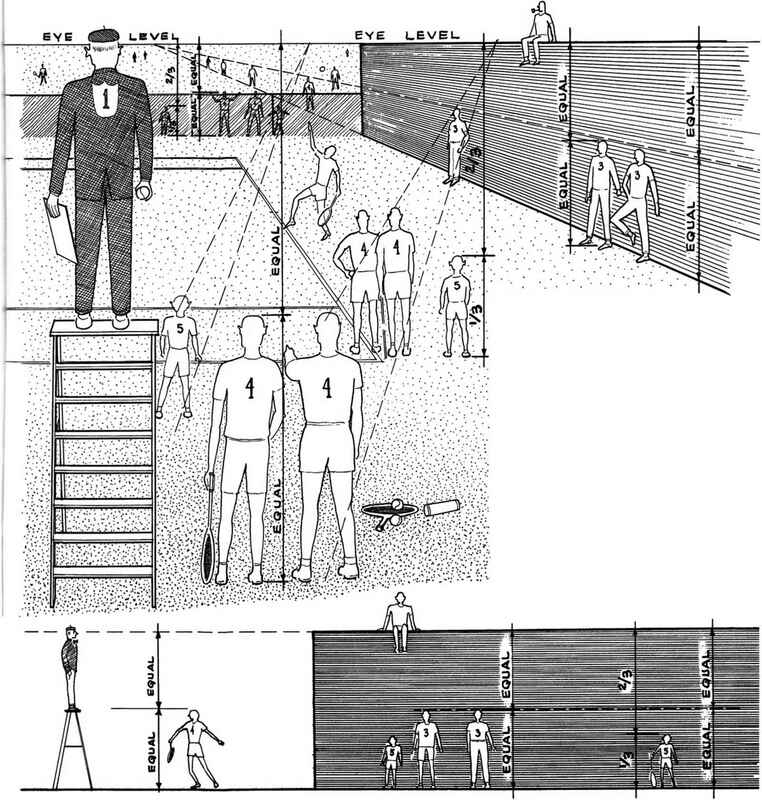 Assume the observer (1) to be 12 ft. above ground (e.g., a 6-ft.-tall man on a 6-ft. ladder). This means all figures standing on the ground would appear below eye level. 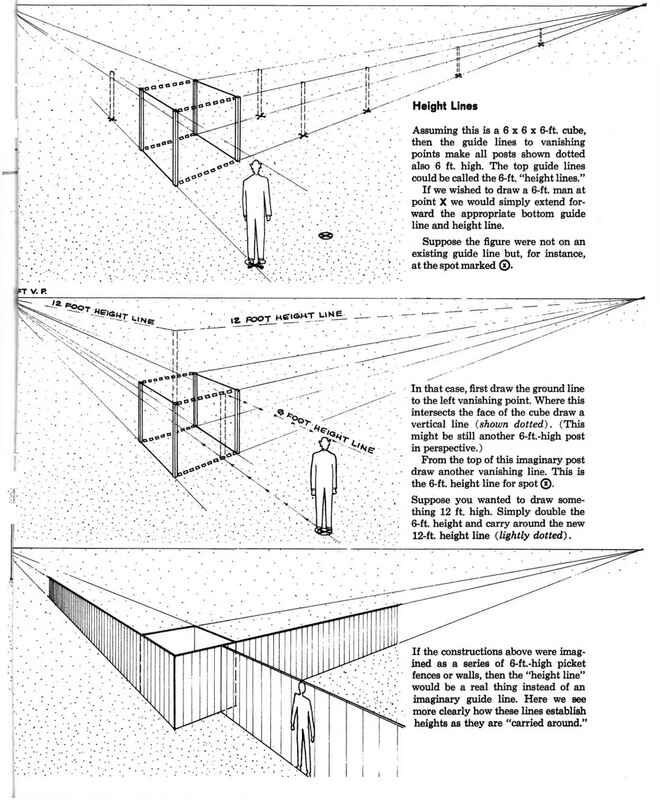 The top of anything 12 ft. high, such as a wall, would therefore be level with eye level (horizon line) and would appear as shown in the drawing below. 6-ft. figures (3) standing along this wall would always be one-half the wall's height—i.e., such figures would always stand at the bottom half of a vertical line dropped from eye level. The dotted line is their "height line." Therefore 6-ft. figures (4) drawn anywhere on the ground would stand at the bottom half of a vertical dropped from eye level. 4-ft. children (5) would stand at the bottom four-twelfths (one-third) of a vertical from eye level. Proof of this system — and still another way of determining heights—can be had by first connecting the heads and then the feet of any two figures of similar height. 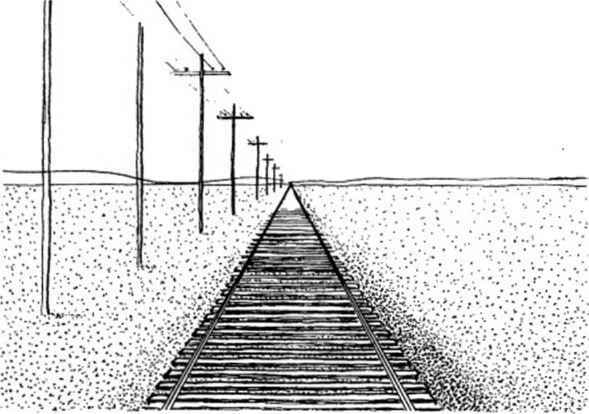 These lines, when brought back, will meet at a vanishing point on the horizon line (see dotted lines). Here the observer's eye level is about 4 ft. above the ground. In such a case, all others who are sitting (1) would also have their eyes at eye level. A boy (3) exactly 4 ft. high would always have his head at eye level. Again, if the heads and feet of any two figures of equal height were connected (see dotted lines) these lines would always converge to one point on the horizon line. Here the observer's eye level is about 1 ft. above the ground. 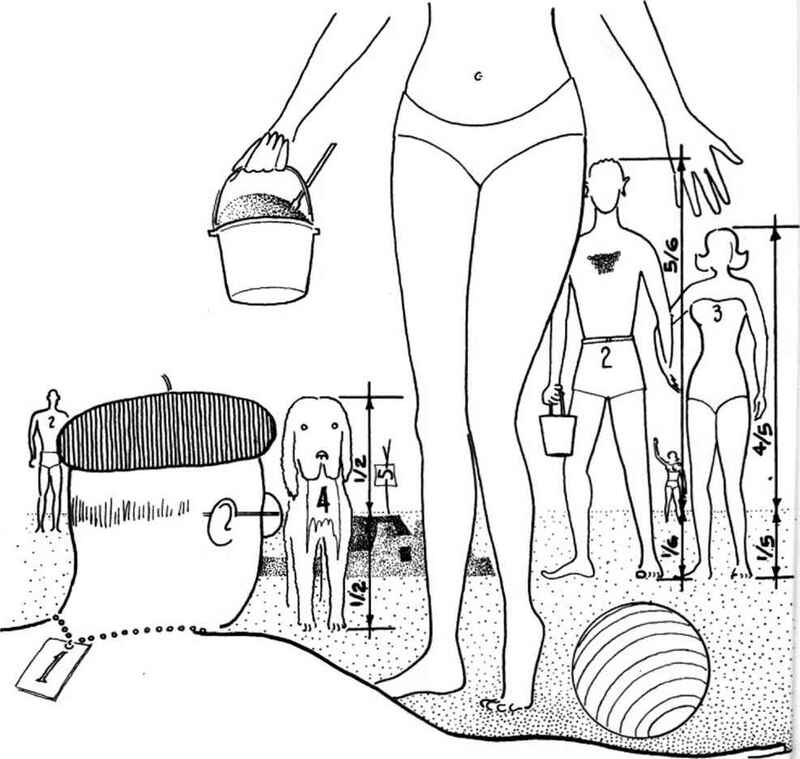 Therefore objects smaller than 1 ft. would appear below eye level (e.g., most beach balls). All taller objects would have their 1-ft. level at eye level — e.g., the 6-ft.-tall figures (2) would always appear one-sixth below and five-sixths above eye level. The 5-ft.-high girl (3) would appear one-fifth below and four-fifths above eye level regardless of location. The 2-ft.-high dog (4) would always appear one-half above and one-half below eye level. And the top of the l-ft.-high sand castle (5) would appear at eye level. Therefore, the eye level-horizon line will cut across the 30-story level of all buildings that have one. 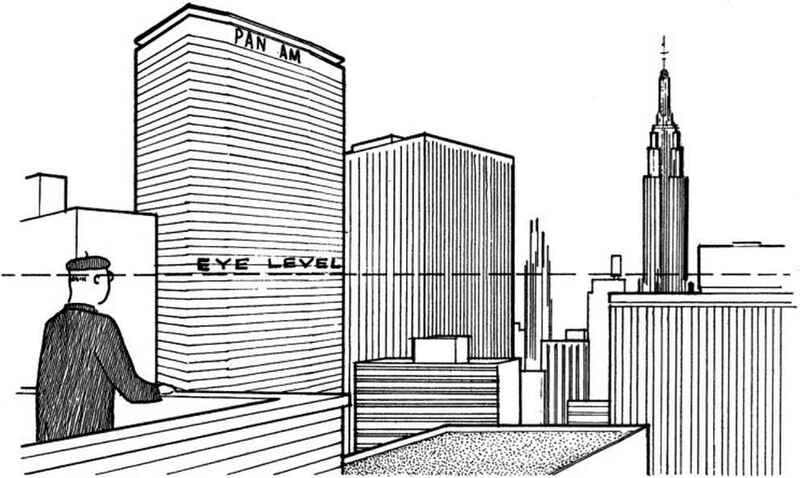 Naturally the 60-story Pan Am Building in the foreground appears taller than the 102-story Empire State Building because it is closer to the observer. But in both cases their 30-story levels are on the same horizontal plane as the observer's eye level. In sketching a room interior, many heights can be found by relating them to wall heights. If a room is 8 ft. high then somewhere along the rear wall (1) or along one of the side walls (2) tick off 8 equal divisions. A 7-ft.-high door next to (1) or (2) is easily drawn. Similarly, a door knob 3 ft. above the floor is located by the 3-ft. height line (3). Suppose we wanted to draw a 6-ft. figure in the foreground. The dotted line (4) would provide the height. 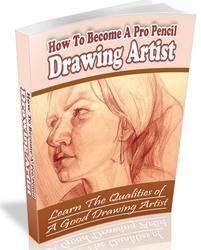 Find the vanishing point of the receding horizontals and note that the eye level of the drawing is at the 4-ft. level. Therefore all 6-ft. figures would appear four-sixths below and two-sixths above eye level, no matter where they stood. 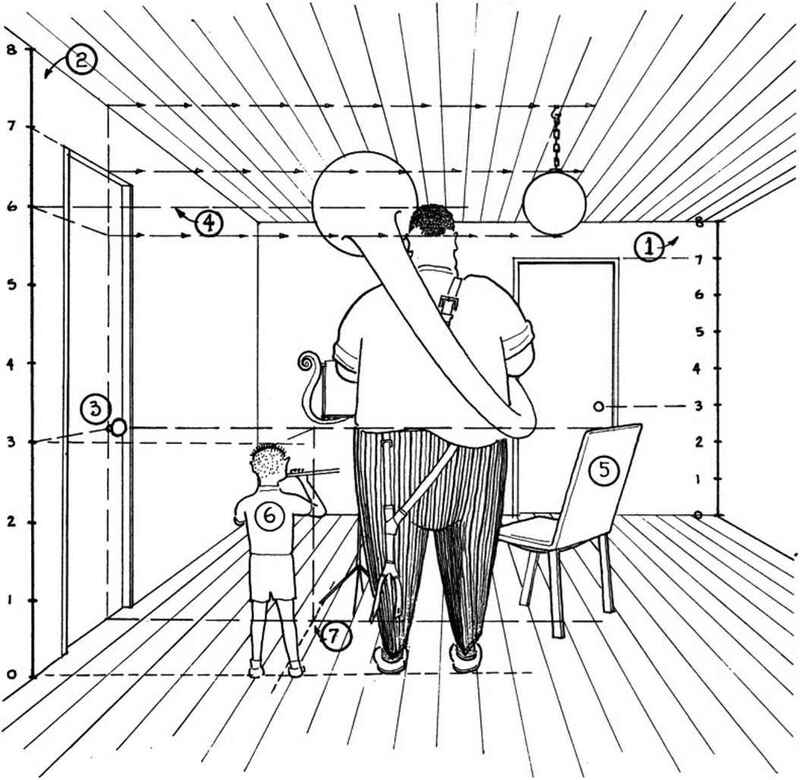 Drawing a 3-ft.-high chair at (5) requires carrying the door knob height across to this point. A 3-ft-high boy (6) could be drawn by "carrying" this height line "around" the vertical at (7). (The guide lines shown use the center vanishing point, but any vanishing point along eye level could be used.) Notice how the boy's height can always be verified by the 3-ft. height line from the left. The l-ft.-round lamp hanging over the chair from a 1 ft chain is drawn by using the guide lines shown as arrows. 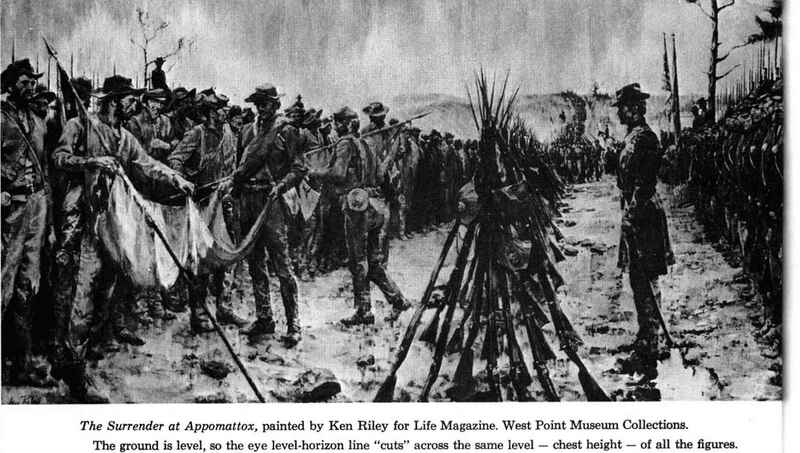 The Surrender at Appomattox, painted by Ken Riley for Life Magazine. West Point Museum Collections. 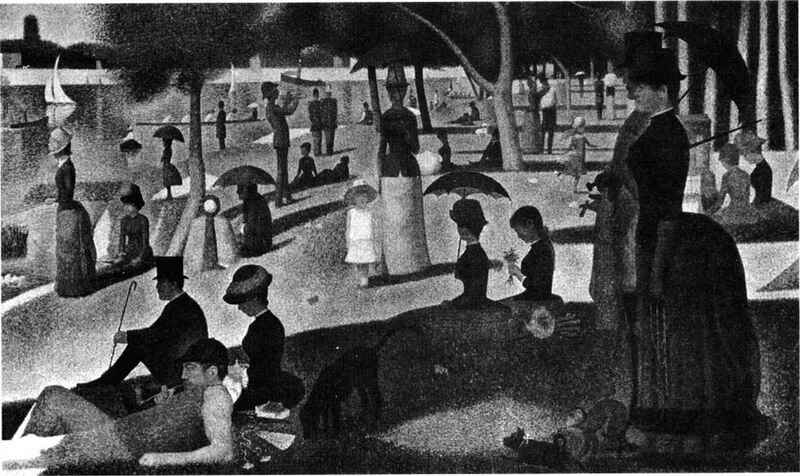 La Grande Jatte, by Georges Seurat. Courtesy of The Art Institute of Chicago. "explains" that the land is sloping. In both pictures we know that the cross-ties are really equal-sized elements. Yet diminution makes them appear successively smaller. The rails converging to a vanishing point act as guide lines for the widths of these cross-ties. The diminution of other "flat" objects, such as boats, cars, people lying on a beach, etc., can be determined by the convergence of similar "width" guide lines. Sketch the first object (1) in a file. Converging guide lines to eye level will define "widths" of equally long objects in the same file (2). Objects outside of original guide lines (3) can be drawn by transferring guide line widths to left or right (e.g., dim. x = dim. x or dim. y = dim. y). What is the height line in a perspective? How to draw perspective engineering? 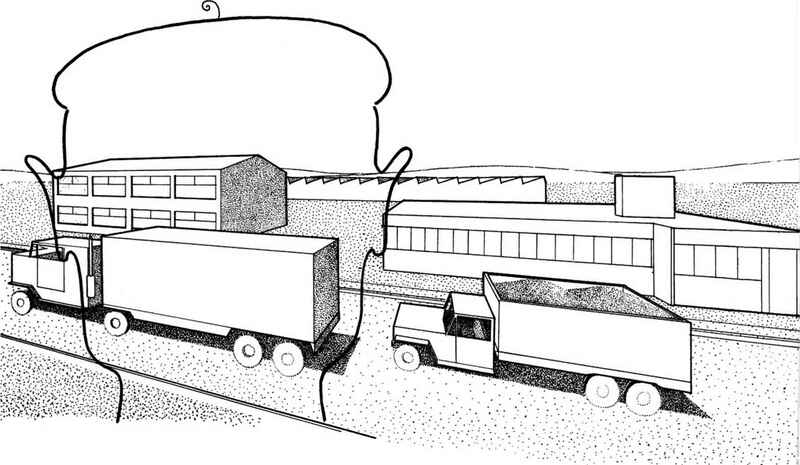 How to draw perspective cone of vision? 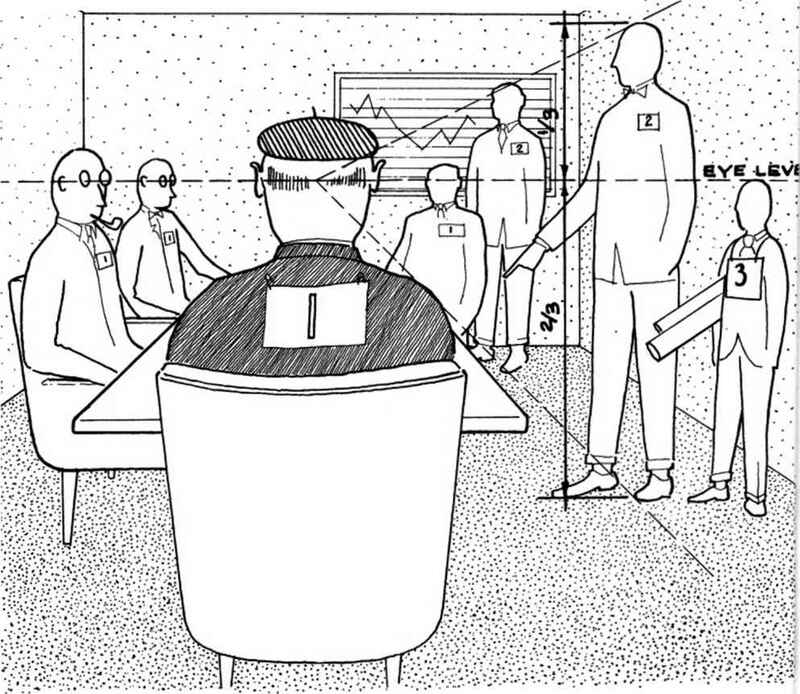 How to draw 1 point perspective eye level? How to make a perspective drawing? How to draw buildings in high perspective? How to know the height in perspective drawings? How to draw perspective download buildings? How to draw buildings from a distance close to the empire state building? Where is observer standing in drawing? Does eye level always have to be a persons height in sketching? How to draw the perspective of humans and buildings together? How to draw a door knob in engineering drawing? HOW TO SHOWN HIGHT IN A DRAWING? How to draw the drawing in hight? What is height line in perspective drawing?